iPod shuffle speaks over 25 different languages so you hear VoiceOver titles & artists in your native languages. 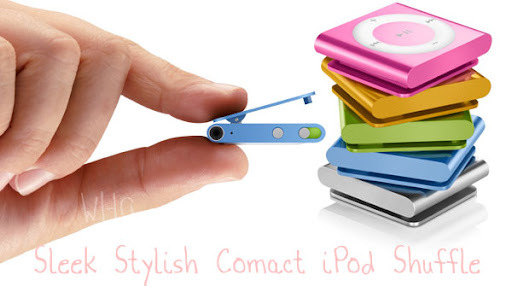 Currently, iPod Shuffle is available with a capacity of 2GB which is enough to load your favorite playlist and music collections along with battery life up to 10 hours. “We’re making the iPod shuffle even better by combining clickable buttons and VoiceOver technology, so users can find and enjoy their music without ever looking at their iPod shuffle. With its all-aluminum enclosure and built-in clip the new iPod shuffle is a great workout companion, and at just $49 it's a great entry-level iPod that almost everyone can afford,” said Steve Jobs, Apple’s CEO. iPod shuffle has a full-size play/pause button even larger than the previous models, so you don't need to ever look at the player. The flip button on the top features three modes: random playing, orderly playing and shuffle off. Dimensions : 1.14" x 1.24" x 0.34"
Apple iPod Shuffle's 2GB model is now available in the Apple Store, Apple's Retail Store, and Apple Authorized Resellers with a price tag of 49USD (approx. 2300 INR). I think with lack of display iPod Shuffle is highly priced. But if you listen to songs without bothering about the tracks then iPod Shuffle is for you.